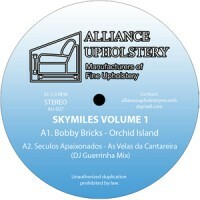 Alliance Upholstery casually switch between reissue treasure and new material magic, with "Sky Miles Volume 1" presenting a global perspective of fresh music from the label, a round trip from Stockholm to Osaka, stopping off in Savannah and Rio along the way. Bobby Bricks (Dream Time, Sweden) kicks us off with "Orchid Island”, an enchanting and uplifting number that conjures images of clear skies and crystalline oceans, the gentle sea breezes lapping against our beaming faces as we arrive at our tropical island soiree in buoyant form. The crew will be around shortly with drinks, so ease into Séculos Apaixonados' (Future Times / 40% Foda / Maneirissimo, Brazil) slow burning love jam, “As Velas da Cantareira (DJ Guerrinha Mix)”. Low BPMs and timely synth stabs bring this bright, leisurely track from Corcovado to your turntable. Great for beginning of the night drinks or post sunrise smooches. As we reach cruising altitude, C Powers' (Sweat Equity / CGI, USA) eponymous “Sky Miles” gets us popping, broken beat syncopation, breezy production and playful percussion making this one dancefloor ready from the get-go. Roy Comanchero (Running Back, Japan) is always greatly admired here at Picc headquarters and “Moon Hike” aptly brings the EP to a natural concludes, a skeletal and quite serene track littered with 303, Roland perc and bright scales. 150 gram vinyl from Brooklyn Phono and mastered by Dietrich Schoenemann.